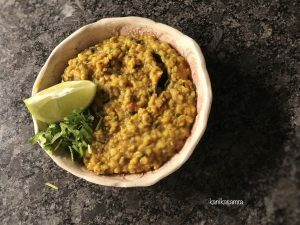 Urad dal has made an appearance on the blog before in its whole avatar i.e. the whole legume with its husk in tact. In that form Urad is dark and hence often called Kaali/Black Dal. The whole dal gives Mahn Di Dal and Dal Makhni their characteristic dark cocoa and chocolate like colour. This is yet another variation with the addition of spinach (palak), hence christened Sookh Urad aur Palak. Husked Urad is extremely versatile and is used frequently to make a variety of dishes from Dahi Bhalle to their south Indian variant Vada, batters for Idli and Dosas, Pappads and as a spicy filling for Kachoris that are round, deep fired savoury pastries. 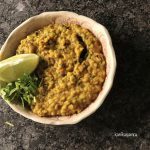 In Punjab the split black lentils are also cooked just by themselves as a drier dal, known literally as sookhi dal in Hindi, that is served with a generous squeeze of lime juice on top. I remember savouring homemade sookhi dal as a child. Since the dal is drier than the usual soupy lentils, urad dal is often served as side dish along with another curried dish. And for that reason, it wasn’t cooked frequently in our home, except on special request or for a change from routine. I was surprised to find a lover of the sookhi urad in my husband. That’s when I figured I should get a handle on making said sookhi dal. But, I couldn’t help myself and made a few changes along the way. The version I am writing about here has finely chopped spinach. Inactive: 15 minutes, Active: 30 minutes. To begin, measure and wash urad dal until the water run clear. Then, while you prep the rest of the ingredients, let it soak in ample water like below. Gather all the other ingredients. Prepare tomatoes and spinach by washing them and then chopping finely. Take a wide wok or pan that has a lid and put it on the stove on high heat. To the heated pot, add oil. Reduce the heat to medium high to avoid smoking the oil. Now, add asafoetida and cumin seeds. 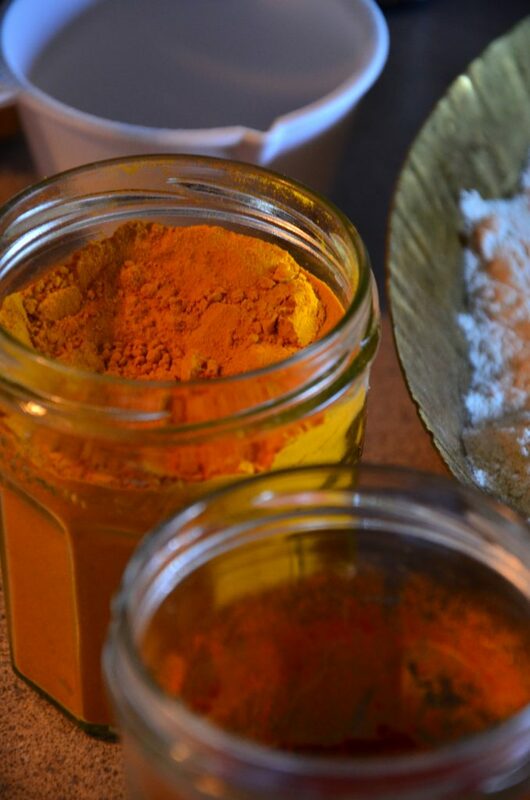 Asafoetida is optional – it isn’t a common ingredient in Punjabi cooking but finds a place in most south Indian curries. I enjoy the flavour of heeng (Hindi for asafoetida) and find that using it often gives the gravy/dal a garlicky flavour. So in my sookhi urad, I skip garlic and ginger entirely. But you can choose to use them, and if that is your preference add them at this stage. Next, add the curry leaves. This is another flavour borrowed from southern Indian cooking. Apparently, I am merely sharing information passed on, at the turn of the last century, meethi neem (literally sweet neem) or the curry tree was abundant in Punjab. But, now it is grown as a domesticated plant for the occasional use of its leaves in cooking. I am yet to find any conclusive evidence or proof to back this claim. If you know can shed more light on this or know about the use of curry leaves in food in the north-western parts of India, please share your insights. Back to the recipe. I use curry leaves because I enjoy their flavour. Skip if they aren’t your favourite. After this come tomatoes. Saute them until mushy and soft. Add salt, turmeric powder, chilli powder and coriander powder. Cook on medium heat until spices are aromatic. Add chopped spinach and cook for a minute or two. Spinach wilts very quickly. Finally, add the dal that has been soaking. Don’t add all the water. You’ll need just enough to be level with the dal barely covering it all. Bring this to a boil and cook uncovered. A froth will start appearing on the surface. This is normal. It is a product of the denaturation of protein in the dal. There is a lot of data and scientific literature on the denaturation of proteins and how that forms foams. So I wont bore you here! For the purpose of cooking the sookhi urad, you should try to skim off as much of the foam as possible, it is not harmful, so if you forget nothing will go wrong. After the first boil, reduce heat to a medium high and cook partially covered, leaving the lid ajar to allow steam to escape. 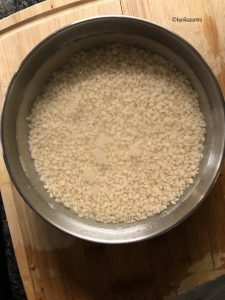 In about 10-15 minutes, you will see most of the moisture evaporate and the dal granules will puff up. Remove the lid and check how much water is left. If most of it has evaporated, cook uncovered on low heat for another 5 minutes. Turn off the heat and fluff the dal with a fork or spoon. ***Note: My dal is a tad overcooked – I started out with more water than needed. So, be careful and go easy with the water! Then transfer to a serving dish and squeeze lime juice on it. Top it off with fresh coriander and enjoy with warm chapatis. Enjoy this lemony Sookhi Urad aur Palak Dal as a side dish or a light snack! A delicious dal that is extremely versatile - use it as a snack or a side for any meal. Wash and clean the lentils, soak while prepping other ingredients. Heat pan and add oil to it. Followed by asafoetida and cumin seeds. Once spluttering add curry leaves. Next add tomatoes, cook until soft. Add dry spice powders and cook until aromatic. Finally add lentils and water, bring to a boil uncovered. After first boil, reduce heat to medium and cook covered for 10-15 minutes. Check for water level - should be almost dry at the end of the cooking period. If not continue cooking uncovered. Fluff with a fork and serve garnished with coriander and lime juice. If you do not like asafoetida, use chopped garlic and a small of ginger instead. Skip curry leaves if not available or not a taste you prefer.